Hearing-related issues are a common side effect of a Traumatic Brain Injury (TBI), especially persistent ear-ringing and sensitivity to sound. Depending on the severity, these side effects may lead to  withdrawal from noisy environments and many previously enjoyable activities. Although Vibes were originally designed for concerts, we've found that they are dramatically helping people who are recovering from a TBI. Typical foam earplugs are unsightly, bulky and ineffective. Custom earplugs are expensive and can block out too much sound. Vibes are not only super discreet, but they also allow people with noise sensitivity to lower the volume of their environment to more comfortable levels while still being able to hear everything around them clearly, including speech. With Vibes, this community can enjoy activities that would otherwise feel uncomfortably loud, while still being able to engage in conversations and hear everything clearly. 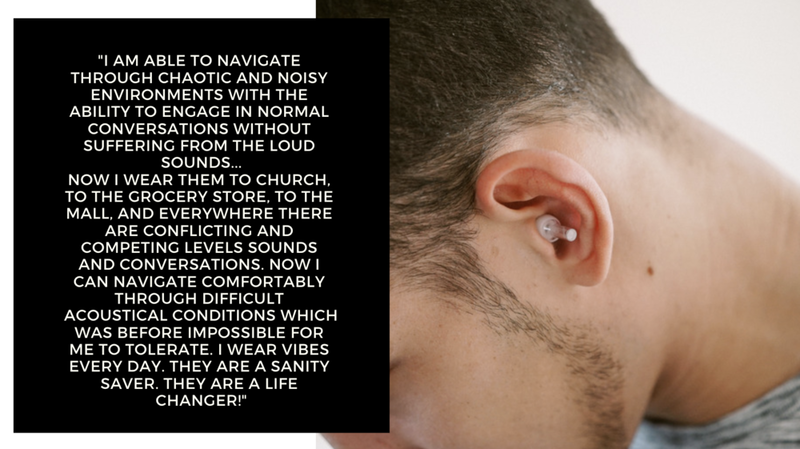 Read more about what people are saying about Vibes Hi-Fidelity Earplugs for Traumatic Brain Injuries here.